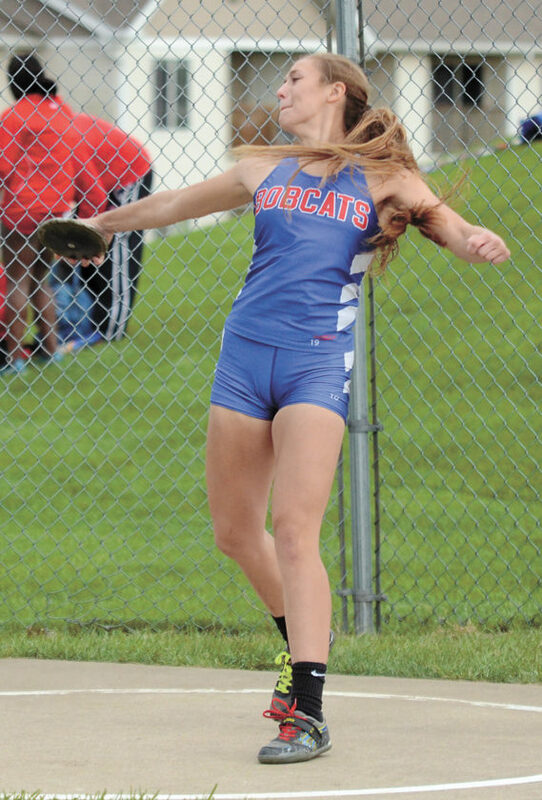 T-R PHOTO BY STEPHEN KOENIGSFELD • Marshalltown’s Malory Henze throws one of her attempts in the discus event Monday at the Bobcat Invitational at Leonard Cole Field. Henze threw 108 feet, 8 1/2 inches to win the event. Malory Henze stood in the power stance and heaved the discus down field. It wasn’t a practice throw, though. 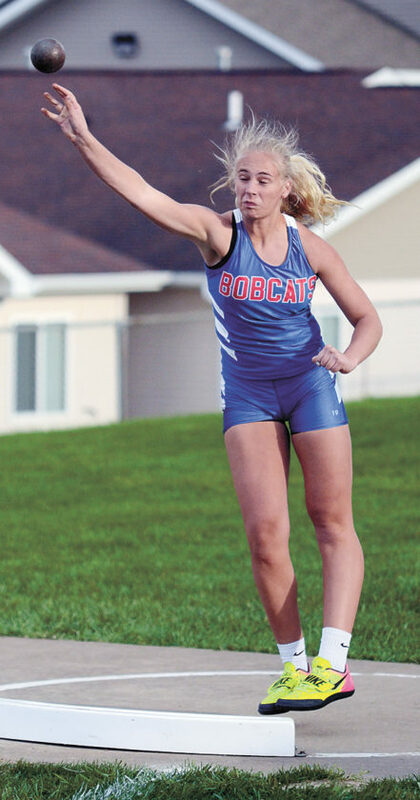 No, her toss of 108 feet, 8 1/2 inches was the best throw — by more than three and a half feet — and it did the trick, winning her the discus title at the Bobcat Invitational on Monday. Henze scratched on her previous two throws, landing much farther down range than her recorded 108 feet. So, when left with a ‘just keep it inside the lines’ throw, she excelled past her competition, even with three more finals throws to go. The senior thrower had been hitting the mark she wanted in warmups, tossing anywhere from 120-130 feet with the discus. But the barriers are as much mental as they are physical for Henze. Her senior season has been a strong showcase of the past four years’ worth of work. 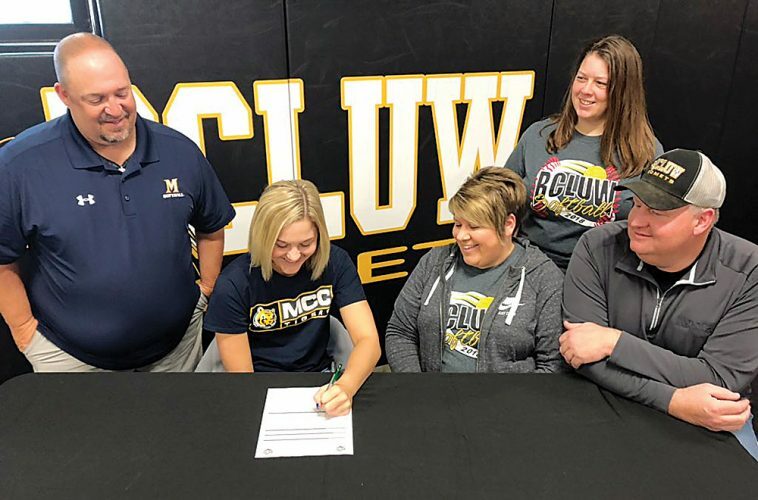 For Henze, the milestone that sticks out in her mind the most was throwing 111 feet as a sophomore thrower. That mark allowed her to see there’s a side past 111 feet she’s was able to, and has conquered. Her throw of 117-10 is the best toss she’s had, with hopes of going farther still obtainable. T-R PHOTO BY STEPHEN KOENIGSFELD • Marshalltown’s Kierra Gardner, left, races to beat out Waukee’s Emma Schossow, right, in the 200-meter dash Monday at the Bobcat Invitational. Gardner was third in 27.60, beating fourth-place Schossow (27.90) to claim six team points. Henze was paired with teammate Grace Metzger, who finished fourth in the discus with a toss of 101-2 1/4. Metzger’s been stronger in the shot, where she finished eighth Monday night (30-5 3/4), but a frustrating couple weeks has Metzger searching for answers before the calendar flips over to May. Metzger said she knows there’s still time left in the season to fine tune the techniques in the ring, and besting her mark of last season’s 32-9 is still on the table for accomplishable goals. MHS girls’ head coach Chad Pietig said Metzger and Henze are accompanied by junior varsity thrower Jill Podhajsky, who threw 102-9 for first in the JV flight, comprise a group of talent that worked hard and did the right things to find the success up until this point. 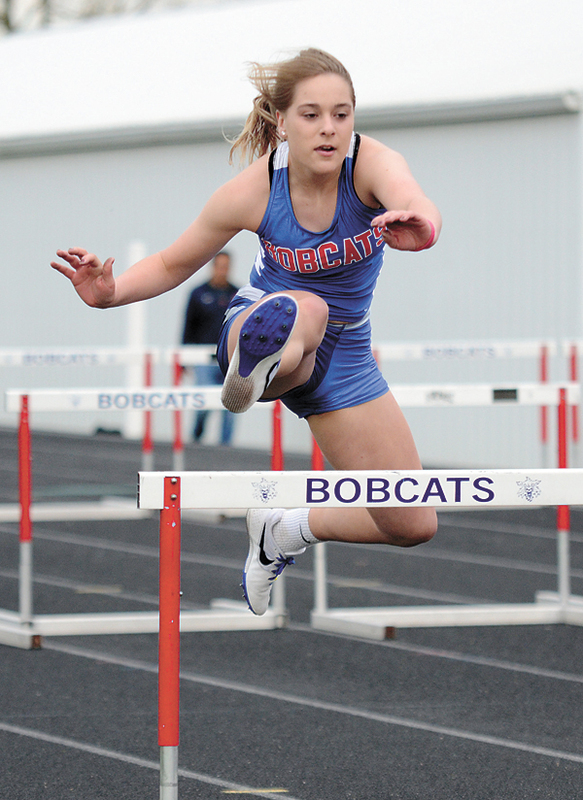 T-R PHOTO BY STEPHEN KOENIGSFELD • MHS hurdler Sami Trowbridge takes on the first leg of the shuttle hurdle relay Monday at the Bobcat Invitational. The relay of Sami, Gabby Himes, Alli Trowbridge and Brianna Dean set a new season best in a time of 1:15.80. Between Henze and Metzger, the two tallied 16 of the Bobcats’ 46.5 points, earning them fifth place at their home meet. As team, the Bobcat girls set personal bests in the sprint medley (2 minutes, 1.10 seconds), 4×200 relay (1:54.40) and the shuttle hurdle relay (1:15.80) with all four hurdlers (Alli Trowbridge, Gabby Himes, Sami Trowbridge and Brianna Dean) all running season-best splits in the relay. The 4×400 also had a season best, running a 4:29.10. Mia Barajas and Kaci Uhde also both set lifetime bests in their 1,500, with Barajas finally breaking the six-minute mark (5:59.00) that has been eluding her this season, and Uhde clocking a 6:07.20. 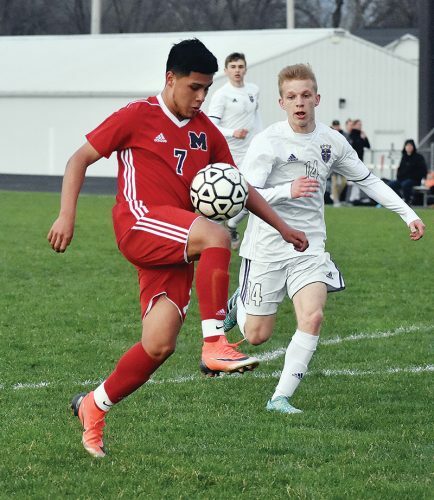 Pietig said by all accounts, the Bobcats took care of business Monday night, beating the teams they set out to beat, and were challenged by the ones who ended up ahead of them. Waukee won the meet with 154 points, with Valley coming in second (121 points) and Ankeny third (93.5 points). Mazour hit 5-1 in the high jump for the first time outdoors Monday night, good enough for third place. He 5-2 jumps came at indoor meets this winter. She also tallied a season best in the long jump, going for 15-8 to take third as well. Freshman sprinter Kierra Gardner challenge the likes of some of the top sprinters in the state, as she took third in the 200 (27.60) and sixth in the 100 (13.30) Monday night. Gardner was running alongside last year’s 4A, 200 state champion and runner-up in Kerris Roberts and Alanna Muhammad, respectively. “Part of it is she’s extremely coachable,” Pietig said of Gardner. “She’s very fast and really strong. When you watch her sprinting technique, you could make a video off her technique. The knees come up and the drive, that’s all natural. She’s got it figured out better than most. 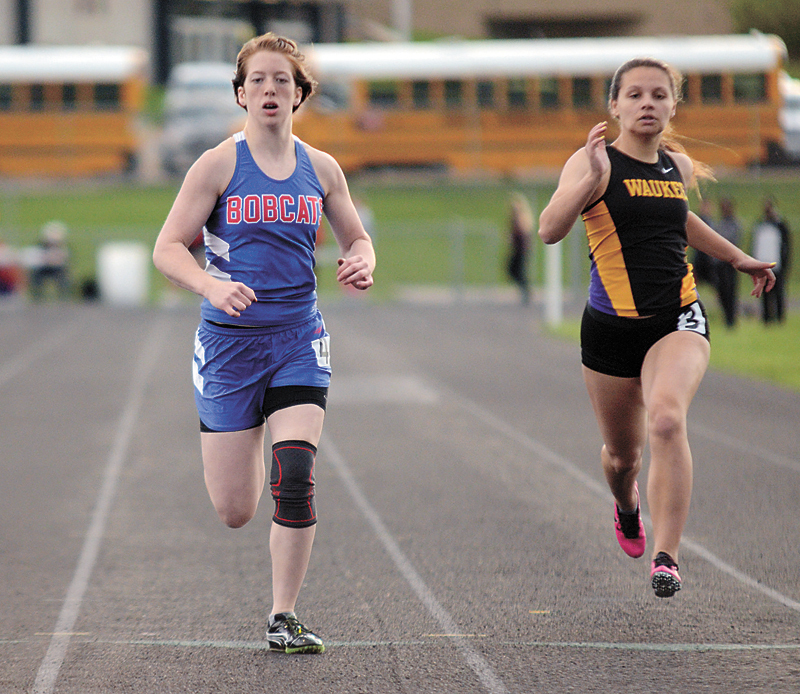 The Bobcats won’t have anyone at this weekend’s Drake Relays, but hit the road May 2 for their next meet at Mason City. Team Standings — 1. Waukee 154, 2. Valley 121, 3. Ankeny 93.5, 4. Waverly-Shell Rock 78.5, 5. Marshalltown 46.5, 6. Waterloo East 37, 7. Mason City 30, 8. Fort Dodge 28.5. 100 — 1. Kerris Roberts, EAST, 11.80; 2. Alanna Muhammad, EAST, 12.60; 3. Kelsey Fischer, ANK, 12.80; 4. Jayda Allen, VAL, 13.00; 5. Emma Schossow, WAK, 13.20; Kierra Gardner, MHS, 13.30; 6. Shareece Smith, FD, 13.30. 200 — 1. Grace Matera, VAL, 26.60; 2. Kelsey Fischer, ANK, 26.70; 3. Kierra Gardner, MHS, 27.60; 4. Emma Schossow, WAU, 27.90; 5. Amanee Clark, EAST 28.20; 6. Jacey Spann, VAL, 28.70. 400 — 1. Janjay Peters, WAU, 1:20.40; 2. Helen Gould, VAL, 1:03.20; 3. Grace Hoins, WSR, 1:03.30; 4. Katie Groetken, WAU, 1:04.40; 5. Kayla Pitz, ANK, 1:05.80; 6. Mackenzie DeMaris, EAST, 1:06.80. 800 — 1. Mallory Sage, EAST, 2:32.10; 2. Bella Trane, VAL, 2:36.60; 3. Isabelle Schaffer, WAU, 2:37.50; 4. Baili Roberts, FD, 2:38.50; 5. Libby Dix, WSR, 2:39.20; 6. Anna Hoins, WSR, 2:39.40. 1,500 — 1. Emma Davison, MC, 5:10.30; 2. Miranda Boyle, WAU, 5:19.90; 3. Ally Schaffer, WAU; 4. Hannah Zadeh, ANK, 5:28.40; 5. Haley Losh, VAL, 5:33.90; 6. Lily Jones, ANK, 5:34.90. 3,000 — 1. Isabelle Schaffer, WAU, 11:19.40; 2. Alex Robran, ANK, 11:23.20; 3 Brooke Trampel, WAU, 11:37.00; 4. Lauren Clark, ANK, 12:34.70; 5. Maya Jalukar, MC, 12:39.00; 6. Emma Figura, WSR, 12:49.80. 100 Hurdles — 1. Cassie Yardley, VAL, 15.60; 2. Haley Beckert, WSR, 16.10; 3. Mikala Sidney, ANK, 17.00; 4. Karlie Wosepka, WSR, 17.10; 5. Sami Trowbridge, MHS, 17.30; 6. Erika Mariner, MC, 17.50. 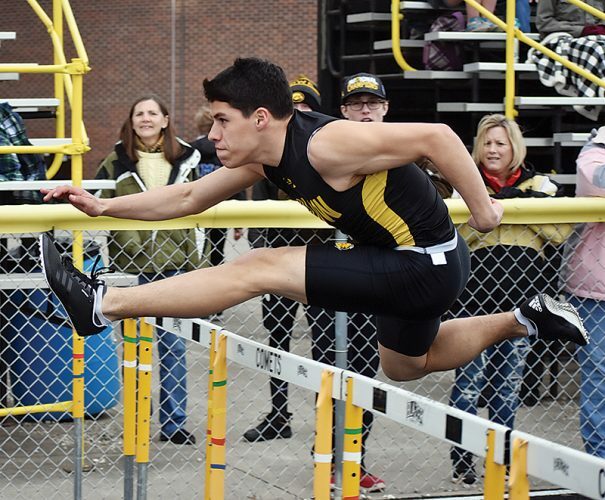 400 Hurdles — 1. Mya Moore, VAL, 1:07.10; 2. Haley Beckert, WSR, 1:09.10; 3. Olivia Sharar, ANK, 1:11.50; 4. Sarah Bosch, ANK, 1:11.60; 5. Jasmine Dunn, WEST, 1:12.30; 6. Kaitlyn Severson, WAU, 1:13.10. 4×100 — 1. VAL 50.70, 2. FD 52.10, 3. ANK 52.60, 4. WAU 52.90, 5. MC 53.40, 6. WSR 55.30. 4×200 — 1. VAL 1:48.80, 2. WAU 1:52.10, 3. FD 1:53.20, 4. ANK 1:53.50, 5. WSR 1:53.70, 6. 1:54.30. 4×400 — 1. WSR 4:13.60, 2. VAL 4:16.00, 3. WAU 4:17.60, 4. ANK 4:18.70, 5. MHS 4:29.10, 6. FD 4:40.60. 4×800 — 1. WSR 10:10.20, 2. WAU 10:20.40, 3. VAL 10:48.60, 4. MC 11:03.80, 5. MHS 11:17.80, 6. ANK 11:21.70. Sprint Medley — 1. ANK 1:54.30, 2. WAU 2:00.40, 3.MHS 2:01.10, 4. WSR 2:01.90, 5. VAL 2:03.00, 6. FD 2:04.60. Distance Medley — 1. WAU 4:35.60, 2. ANK 4:39.50, 3. VAL 4:44.30, 4. WSR 4:49.90, 5. FD 4:51.50, 6. MHS 5:46.50. Shuttle Hurdle — 1. WSR 1:09.20, 2. VAL 1:10.00, 3. WAU 1:11.90, 4. ANK 1:13.30, 5. MC 1:15.00, 6. MHS 1:15.80. High Jump — 1. Ellie Hemesath, WAU, 5-2; 2. Piper Watson, MC, 5-1; 3. Regan Mazour, MHS, 5-1; 4. Grace Reyerson, WSR, 4-10; 5. Dajah Baptise, ANK, 4-10; 6. Maggie Clark, WAU, 4-8. Long Jump — 1. Cassie Yardley, VAL, 16-4; 2. Janjay Wau, Peters, 16-1; 3. Regan Mazour, MHS, 15-8; 4. Shamya Jenkins, EAST 15-7; 5. Avery Buseman, WSR, 15-6 1/2; 5. Malea Daugherty, ANK, 15-6; 6. Krissa Larson, WSR, 15-6. Shot Put — 1. Kat Moody, WAU, 45-4; 2. Moe Nealey, WAU, 44-3; 3. Car’Maiya Mosley, FD, 38-5 1/2; 4. Sydney Flatness, ANK, 33-11; 5. Carlie Robbins, WSR, 32-5 1/2; 6. Jordyn ANglea, VAL, 32.2 1/2. Discus — 1. Malory Henze, MHS, 108-8 1/2; 2. Kat Moody, WAU, 105-3 1/4; 3. Madison Green, VAL, 102-7; 4. Grace Metzger, MHS, 101-2 1/4; 5. Kara Smith, WAU, 98-4 1/2; 6. Jordyn Anglea, VAL, 89-1/2.